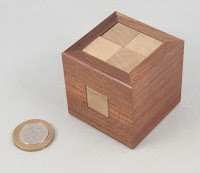 Back in January last year Eric Fuller offered some burrs linked by a bit of a theme for sale on Cubic Dissection – and I was a bit slow on the uptake and managed to miss all of them at the time – you have to be quick when Eric offers puzzles for sale, they never last long! I’d managed to acquire a copy of Three Sticks Trapped from Oli a few months ago, but more recently I managed to pick up a copy of Four in Two and Five Piece 28 as well – completing the Three - Four - Five themed set of designs by Stéphane Chomine from that offering. Three Sticks Trapped is a cute little design that has three yellowheart sticks that fit into a walnut collar with a couple of little protuberances – simple! 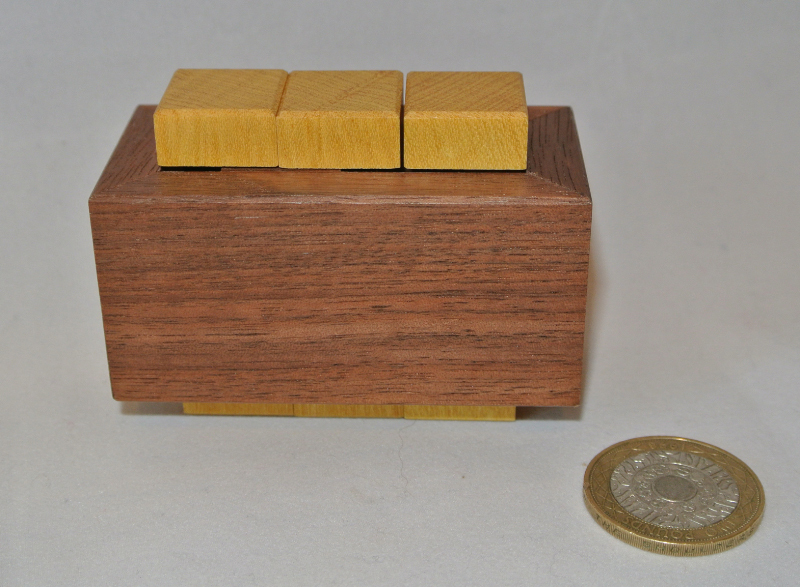 Two of the three sticks are the simplest burr piece possible (sometimes called the skeleton, it is the minimal structure – the least amount of wood to hold the two ends together) – providing maximum room to manoeuvre. The third stick has a bulge in the middle and, wouldn’t ya know it, it gets in the way all over the place. There seems to be a lot of movement at the start – largely thanks to those skeleton pieces, and yet, in spite of that, disassembly is far from trivial! 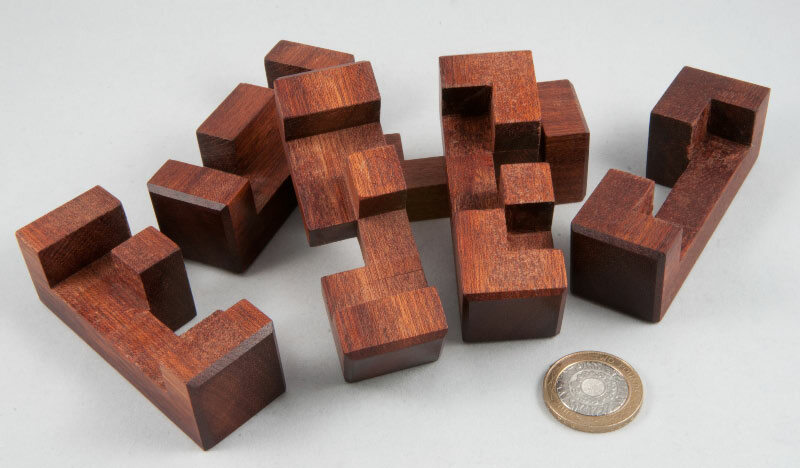 In fact, releasing the first piece takes 12 moves! 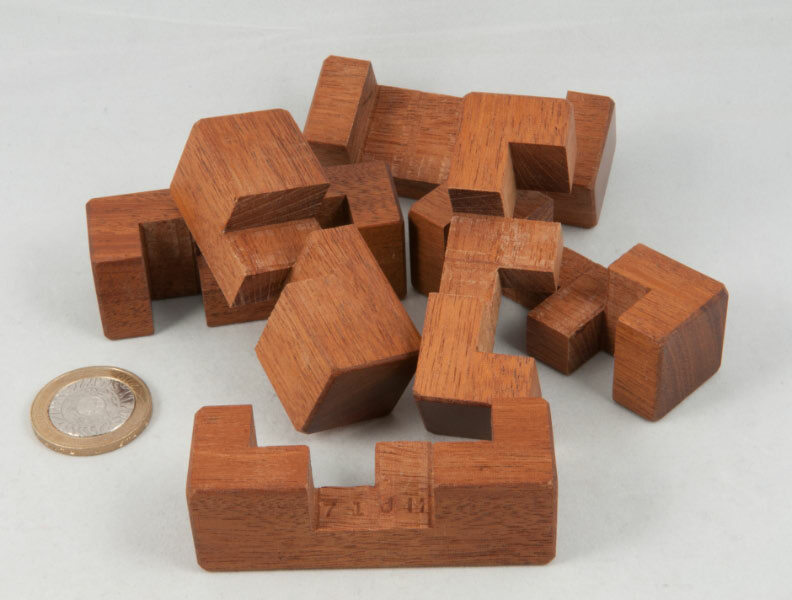 Along the way you’ll find a neat little surprise when the pieces don’t quite come out in the way you’re expecting and even seem to contradict Pauli’s Exclusion Principle. Neat little puzzle that isn’t nearly as simple as it ’should’ be. 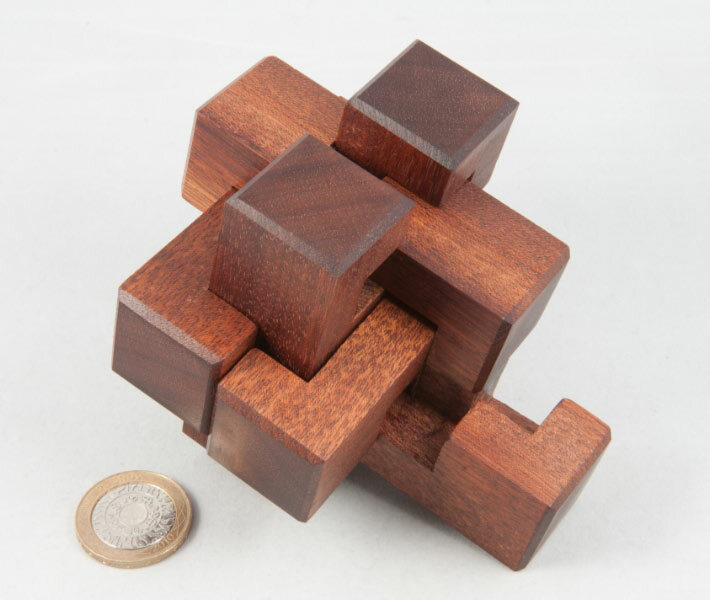 Four in Two is an unusual design that has four mahogany sticks passing through two square walnut collars. Each collar has a different set of protuberances on three of the four inside faces and the sticks are anything but simple. Fourteen moves are required to extract the first piece – and it’s not the one you’re expecting! The first seven or so moves are pretty standard, but then the split collar comes into play and things start getting a bit funky. Once you’ve removed the first piece, getting rid of the second one takes a further seventeen moves(! ), and from there on out there’s pretty much enough room to make removing the last couple of pieces fairly straight-forward. The split-collar gives this design a really neat little twist (figurative, not literal! 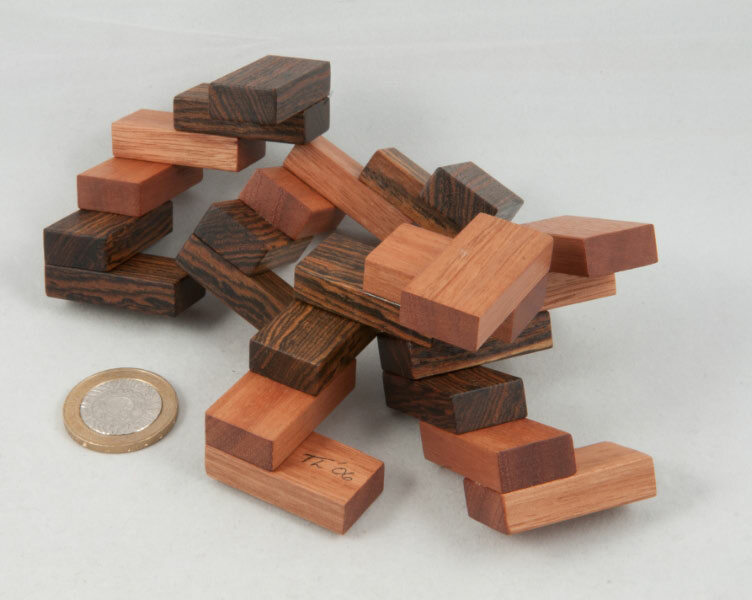 ), allowing you to make some space to manipulate the sticks in a rather unusual manner. Five Piece 28, as you might expect, has five gum sticks through a walnut collar requiring 28 moves to release the first piece ... now the interesting thing about this design is that one of the sticks passes through the others at right angles, locking them in place in the collar. At the start, there is a lot of movement – handily providing several blind alleys for the puzzler to lose himself down for a while... and given that there is a unique solution, there are a lot of ways not to solve this puzzle. The solution involves not just the usual “let’s make some room” phase of solving this sort of puzzle, but adds in a little about-face that might make you think you’re doubling back on yourself and, as with the other two, there’s a bit of a surprise in how the first piece is removed – this solution is anything but linear, although no twisting is used in any of these puzzles. 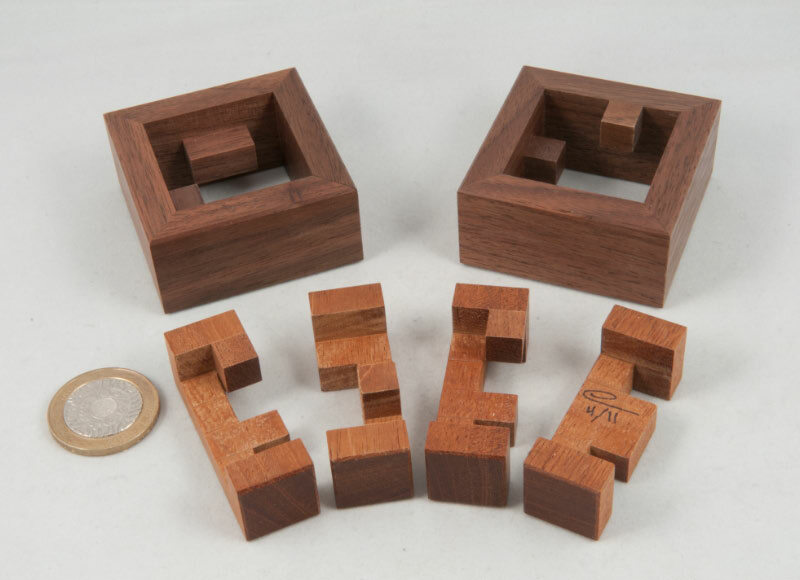 A lovely little matching set of puzzles in Eric’s standard, practical size – beautifully made with just the right tolerances to stop you doing anything silly, and allowing valid moves to progress perfectly. Thanks to Oli and Karl for letting me get my hands on this little set in the end, despite my initial tardiness! 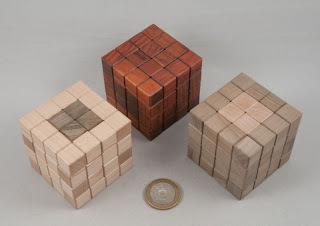 I first stumbled across a set of three 4*4*4 cubes by Mineyuki Uyematsu (or just Mine) at Wil Strijbos’ place last year – he described them as quite interesting and admitted that he hadn’t solved them yet, which was all the encouragement that Louis needed to throw himself at one of them … however by the time we left that evening, it remained unsolved. 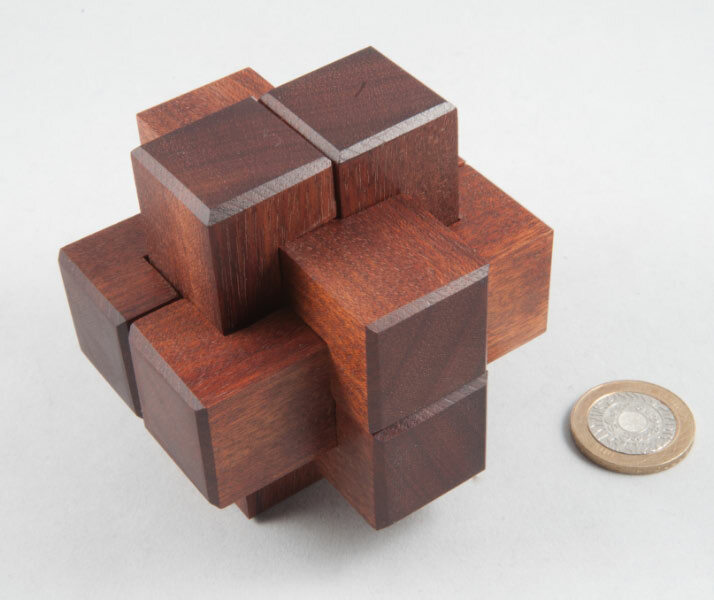 The next day I happened to spot one of them (Lock-Y-Cube) in Bernhard Schweitzer’s crate of unusual puzzles at the Dutch Cube Day and helped myself to it (having paid, promise!) – I left it in Eindhoven for Louis to solve and he duly brought it back to me in December having done exactly that (apparently the mechanism was a bit ‘rusty’). 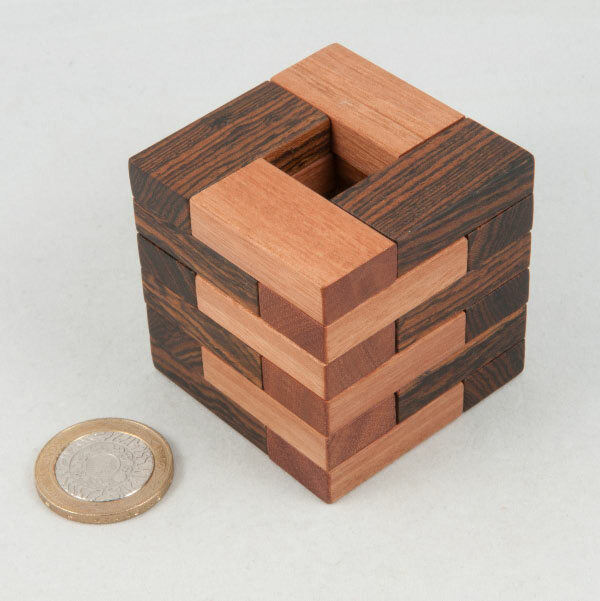 I’ll start with the Disjointed Cube as it’s the least sneaky of the cubes. 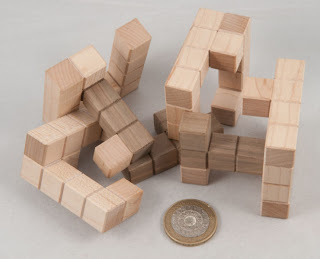 Playing around with the cube you’ll quickly distinguish a few pieces and find that you can expand it in one direction and create some space to fiddle around with the other pieces, a bit, but not enough to really be useful. I played with it for a little bit before I noticed something a little unusual and then found I was able to remove a piece (which actually surprised me at first!). Having dispatched a piece, a little more movement becomes available and some manipulation will successively release the rest of the pieces. 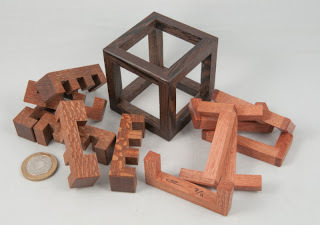 Reassembly is reasonably straight-forward as there’s only really one piece that has to go in last and unless you’re incredibly creative, I think there’s only one way that the pieces can fit together to form a cube. 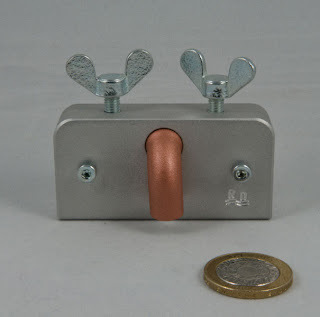 I found it quite an interesting design as it needs you to keep your eyes open and not just do the obvious, linear sort of things that you are probably programmed to do – well I am anyway! The two Lock-Cubes are made in contrasting green and white woods with their patterns reversed, so there’s a bit of a clue that they may be related in some manner. 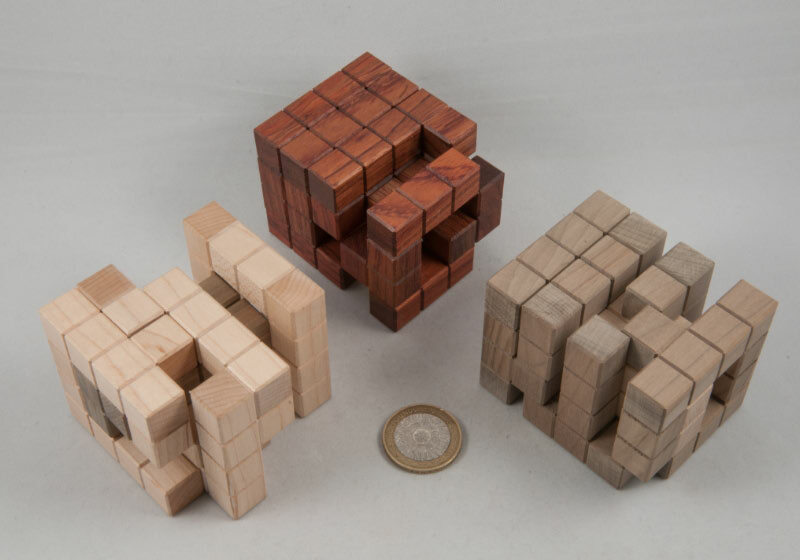 Both cubes will expand in a similar manner to the Disjointed Cube, but that’s where the similarity ends! These cubes seem to have pieces that are largely ring-shaped around the waist of the expanded cube, and the rings may slide up and down a bit, but they won’t do anything useful at all. There is literally no potential route out for any of the pieces… and that’s about as far as we got exploring them at Wil’s place – plenty movement – nothing useful. Nice set of cubes, and I suspect that offering them to a puzzler together, with a suggestion that they work on the Disjointed Cube first might just maximise the puzzling pleasure… and surprise. I’ve recently come across a couple of rather interesting, if not innocuous-looking six-piece burrs. The first is a copy of Bill Cutler’s L5 Notchable Burr. One of my puzzling buddies recently decided to slim down his collection a bit and spend the proceeds on some camera equipment – and it would have been rude not to support his new venture, so I bought a few puzzles from him, including this one. Giving credit where credit is due, Bill’s website lists this design as being “Discovered by computer program in 1987” – coyly avoiding to mention the fact that he happened to have written the program to explore the possibilities and is the guy who’d been studying these burrs in more depth than anyone else around – so I reckon we can all agree that this is Bill’s design, so what if he used some of the newer tools available to designers. This one was made by Jerry McFarland and one of the mahogany pieces has his customary JM stamp on it ... along with the digits ‘71’ – which confuses me as I don’t think it refers to the design, and it can’t be when it was made... any thoughts? It’s a fun little burr to play with - in spite of it ‘only’ having a level 5 solution, assembling it is a pretty decent challenge, and taking it apart involves a good degree of progressively opening it up more and more before the first piece will emerge – really interesting little burr – and a good spot among the thousands that Bill’s analysis must have thrown up. The second burr came to me by a slightly more circuitous route – all-round Burr-wizard Guillaume Largounez (yip, the same guy who facilitated those monster burrs!) got in touch a little while back and asked if I was interested in a copy of Abad’s Level 9 burr. 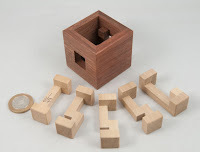 As it wasn’t a name that I recognised, I did a little surfing and had a look at the pieces laid out on Ishino’s web-site – and one look at the pieces will show you why it’s now a well-known design ... a point that Guillaume made in his email – those pieces are a serious challenge to manufacture! Comparing these pieces to the notchable ones above is like comparing chalk and cheese – a couple of these pieces require all sorts of wood-working shenanigans to get a square corner in there. 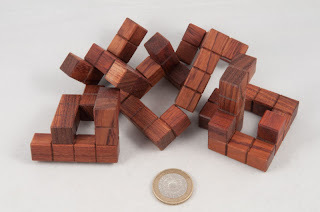 Guillaume had convinced Maurice Vigouroux (yip, him again) to make up a few of these in Satin Bloodwood and after a small dent hit my bank account, one of them duly headed in my direction. This is a mean little burr... assembled on the shelf it looks like any other standard six-piece burr – but start playing with it and it gets your attention rather quickly – there’s a lot you can do with these pieces, and a few blind alleys to get lost down. 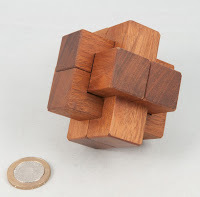 The solution appears to consist of a couple of stages where you start by opening things up a bit, then move a piece or two ‘out of the way’ before opening it up some more and eventually, nine moves in, the first piece comes free – at that point you won’t be surprised that it pretty much crumbles in your hands when you see quite how far apart all the bits are at that stage. A really interesting burr designed by Rafael Guarinos Abad and expertly made by Maurice Vigouroux – very chuffed to have one of those in my collection – a really unusual little guy. Several seriously talented craftsmen have produced versions of Oskar van Deventer’s Domino Tower. According to the pencil signature, my recently acquired copy was made by Tom Lensch in 2006, but other versions have been produced by Scott Peterson and John Devost. Oskar’s design is delightfully simple with four identical pieces, each consisting of 6 domino-shaped blocks, that interlock to form a tower. Given the size and shape of the pieces, you’re almost certainly going to pick up the tower in a grip that will push the pieces together, which might leave you a little confused for a short while. Most of the fun is to be had in playing with the bits and experimenting with alternative ways of putting the pieces together to form different sorts of interlocking shapes and experimenting with different patterns and colouring on the shapes you’ve made. My copy of Roger’s Wasserhahn (literally the German for ‘tap’, or ‘faucet’ if you speak the other version of English) has been staring at me from my shelf-of-puzzles-to-be-solved for months now. Every now and then I’ve fancied a shot at it and tried to come up with something new, and every time I’ve been disappointed…until this past weekend. Wasserhahn has a copper coloured spout coming out of the front of the standard Roger-sized block – and there are a pair of wing-nut-headed bolts screwed into the top of the block on either side of the spout. The spout will spin around freely no matter what you do to the puzzle, and peering into it doesn’t give anything away … unless, maybe, you could peer around the bend in the spout, and shine a light in there while you’re at it – flexible endoscope anyone? (Nah, didn’t think so … that just wouldn’t be cricket, would it?) 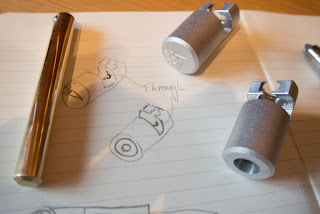 The bolts can be screwed in and out about an inch each, with no discernible effect whatsoever. 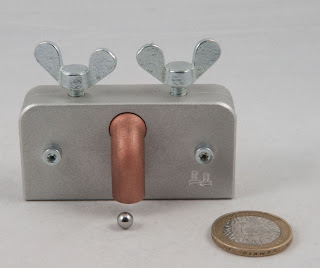 In the innards, you can hear something that sounds a lot like a ball bearing, and probably something else, that doesn’t sound like a ball bearing – more like a small strip of metal sliding around in a channel of some sort. As is customary with Rogers, the puzzle doesn’t come with any instructions or clues (although I have heard they used to come with solutions! ), but if there were to be an aim, I’d guess it would be something like “Free the water” – entirely logical for a tap, not so? Anyway, there I was, occasionally playing with it over the course of several months, and getting nowhere, when one day Wil Strijbos was playing with one of them and asked me if I had one (and the thought crossed my mind to deny all knowledge of the puzzle and buy one from him, effectively restarting the clock on my failure to solve it!) – I admitted I did and that it was defeating me, so he stared me in the eye while chatting about something else and began fiddling around with his copy out of sight and then promptly brought it out from behind his back having supposedly (!) removed a ball bearing from it – a little drop of water from the tap. I was more than a little gobsmacked – not only had he done this right under my nose, he’d been chatting to me at the time about something else entirely and didn’t seem to be concentrating particularly hard on opening it, yet he’d literally just solved it there and then … like a damn good close-up magician. 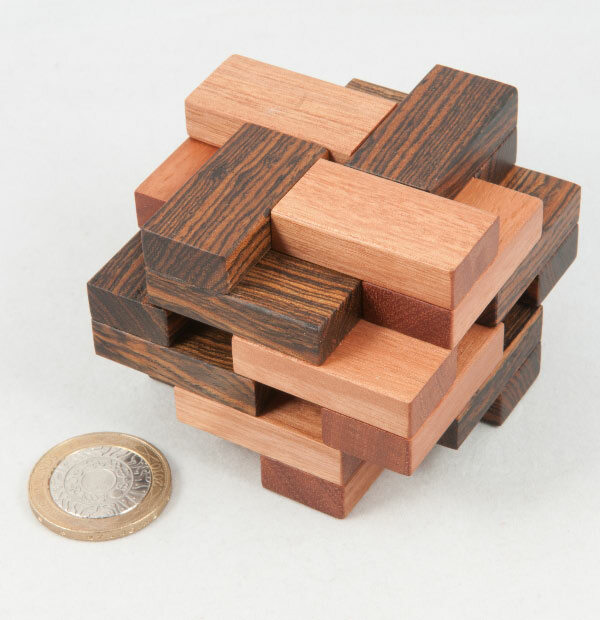 Ages later I was chatting to Nigel about this puzzle (he’d recently come across one as well) and he said something that made me ask a couple of questions – which in turn rapidly led me to the solution – and I’m really glad we talked, because there is absolutely no way I’d ever have found that solution on my own – I would simply never have done that to one of my puzzles (!) – which is saying quite a lot as I have a reputation for being a bit ham-fisted. I’d already tried tapping, bashing and knocking things – sometimes enthusiastically! I’d spun various things, many ways, shook it senseless – nothing! However, having had the seed sown in my mind during that chat, I solved it in one hand while holding the phone in the other and chatting to Nigel … but I’d never have got to it on my own… Thanks for the nudge, Nigel – you’ve helped me free up a little space on that shelf. I was delighted a little while back when an opportunity to acquire a copy of Roger’s Eis puzzle fell into my lap. 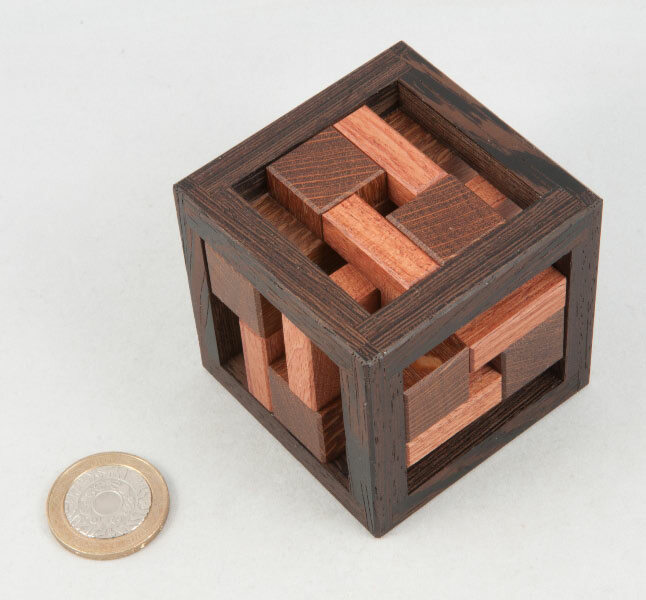 I’d first read about it on Rob Stegmann’s website – notably the fairly recent story of how this puzzle has remained unsolved in his collection for ages, until a friend miraculously opened it – and how even after studying it opened, he still struggled to repeat the solution back at home. 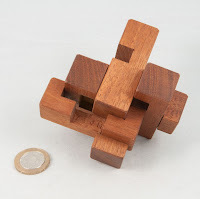 Suffice it to say that this story filled me with no small amount of respect for this puzzle, and a fair amount of trepidation when I started playing with it. 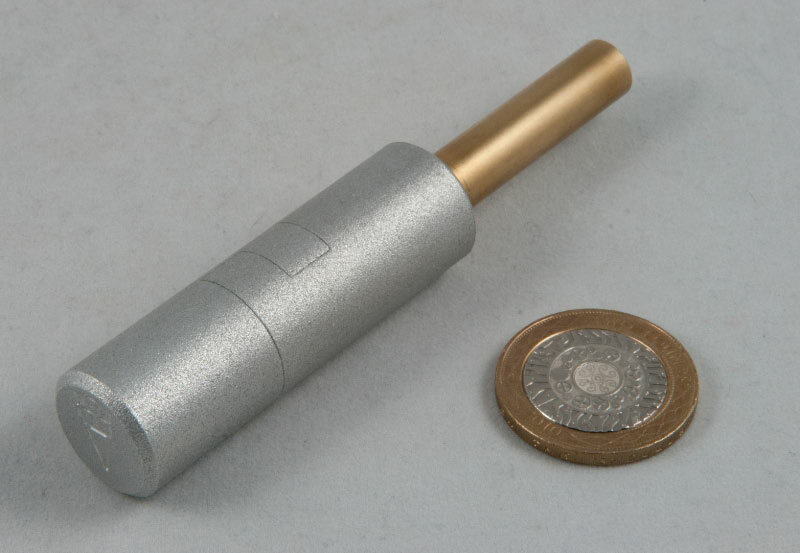 The puzzle looks like a kids’ ice lolly – hence the name – with a brass stick protruding out of the end of an aluminium lolly. Close examination of the lolly bit shows that it’s made up of two parts that overlap and join in the centre. 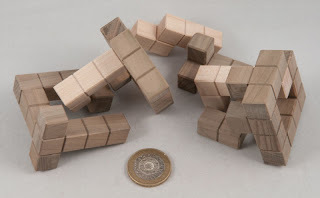 The brass stick bit can be rotated and sometimes pushed in and out of the lolly bit… and when it’s quite far out, the two bits of the lolly feel a little looser – suggesting that you’re trying to disassemble the puzzle. I had a look at the bits and thought I’d recognised some of those Revo-like features (remember this puzzle pre-dates Revomazes by at least a decade!) before Oli reassembled it only for it to remain closed for the rest of the day. Back at home I had a quick fiddle with my copy again and got absolutely nowhere before setting it aside until last Sunday, when I decided that I should approach it like it was a Revomaze, and try some rudimentary mapping of what was going on inside there … so armed with my trusty Sharpie pen, I started sketching out some paths on the brass shaft (it’s a Revo-puzzle now, not an ice lolly!) 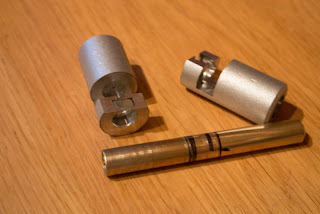 and soon enough found that I could explore some new areas and go where my little map suggested I shouldn’t be able to … which got me to the point where I could pull the shaft right out and open the two aluminium parts – job done! Examining the innards of this puzzle has given me a huge amount of respect for Roger’s eye for engineering design. 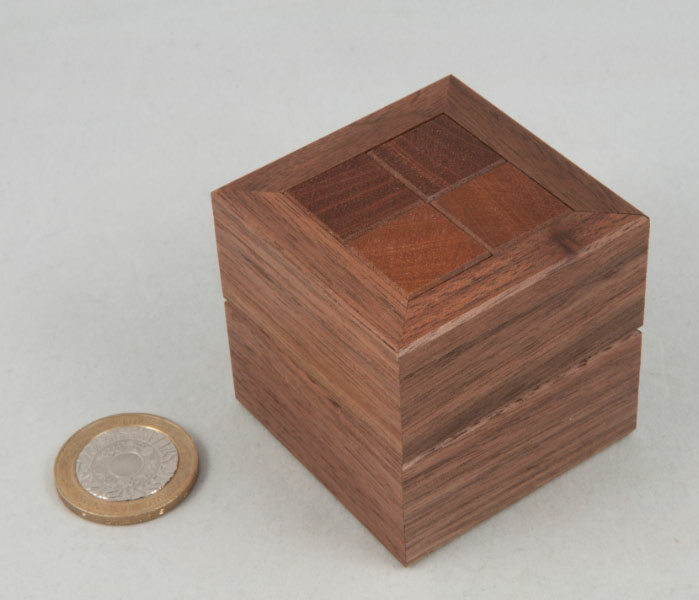 He’s used several elegantly simple ideas in a very restricted space to make a rather interesting little maze – one that you cannot navigate by luck. The symmetry in the pieces is beguiling and in fact a careful analysis of the outside of the puzzle will actually help you understand the insides – although you may not realise that until it’s too late! The implementation of the “springy bits” is one of the most sublimely elegant solutions imaginable … except I wouldn’t have imagined it in a million years! … and the kicker – you could show someone a picture of the bits and they will still struggle to open this puzzle – witness the fact that Rob has a picture of the bits on his website, I looked at them when Oli opened it and it still defeated me until I took out my trusty Sharpie pen – well that’s my story, and I’m sticking to it!